What is a blocked sewer drain and how do I know if I have one? Having a sewer drain blocked can be a hassle, and this can cause problems on multiple levels affecting different fixtures and components. Identifying the problem is the first step. What is a Blocked Sewer Drain? A blocked sewer drain refers to a main sewer line pipe on your personal property which has become clogged with waste or outside debris. Sewer drains are unique to each house and the main drain will have all of the branch lines (drain lines from each of the individual fixtures) attached to it. This main sewer line will lead all of the sewage of the home off of the property into a city sewer system or a septic system. Maintenance of the sewer drain is the responsibility of each homeowner. 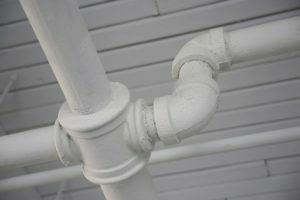 There are a variety of factors which can lead to a blocked sewer drain. They can range from excessive toilet paper, irregular flushing, and even natural occurrences such as underground burrows or even a crack and infiltration by tree roots. What Are the Signs of a Sewer Drain That Is Blocked? A clogged sewer drain is generally identifiable by multiple fixture clogs. Since multiple drain branch lines connect to the sewer line main, a clog here can affect many individual branch lines. A common example would be a clogged toilet that would also cause your shower drain to backup. You may also notice a foul smell on your property which can be another sign of a blocked drain. What Happens if I Ignore a Blocked Sewer Drain? Ignoring a blocked sewer drain will not make it go away. This type of blockage can not only cause frequent flooding in your bathroom, it can also lead to flooding in your yard. Catching a blocked drain early can generally minimize the total financial impact on you and your family. How do I Clear a Blocked Sewer Drain?